Ten Ways to Change Your Behavior Immediately #6: Turn it into a Game! Work couldn’t possibly be fun… or could it? The very word conjures up images of endless factory lines with single repetitive tasks for hours on end, or row upon row of cubicles with people chained to their desks… Of course this is all very melodramatic, but you get the point: work is not something that most people think of as being fun. Why that’s almost the very definition of work! Let’s turn things on their head for a minute. Remember how to be curious and ask yourself: how could you turn work into a game? I can think of one way right off the bat… here you are, trying to get a stubborn primate to diligently execute some boring task it doesn’t even want to do! What a ridiculous situation this is! Trying to get this primate to cooperate seems harder than herding cats sometimes. So turn your resistance into a game. From a place of curiosity and compassion, start trying different things to see how the primate responds. Could you actually trick him into doing work… and enjoying it? First try making the work itself into a game. Throw yourself a party every time you accomplish a goal, and really celebrate that victory! Play it up, because you deserve it. Figure out how long you think this task is going to take, add another half of that to your time estimate, and then turn it into a race against yourself! Then turn increasing productivity into a game too. Try giving the primate incentives: set goals and rewards for yourself, and make sure to actually treat yourself if you reach them. Maybe keep tasty food on hand for this purpose, or commit to paying for a massage or letting yourself goof off for a bit. Go down the list of recommendations I am giving you and try each one in turn, see if it works and why it does or doesn’t. Keep doing what works, figure out what doesn’t, and how you need to tweak it for your next experiment. When you are treating productivity as a game, the consequences feel much less dire and it is easy to be in good spirits about the whole thing. This is how work becomes play! The most natural thing in the world is to get stuck in our usual patterns. We do the same thing day in and day out and it becomes a habit, it feels incredibly easy or maybe even right to take the same action. Each time we follow the path of least resistance we create a slightly deeper mental groove, which makes the next iteration even more difficult to escape. It is time to break the pattern. Take a deep breath and change your context. Now, I want you to look at your situation with fresh eyes. Forget for a moment everything you think you know – pretend you are an alien who has just been dropped into your body here on Earth. Be curious about yourself, your reactions, what you are trying to accomplish and why. You need to find out more information about the situation, so start listing a bunch of questions that you would need to answer to be able to make the best decision. Write as many questions as you can before you start trying to answer any of them. The purpose is to explore as much as possible before proposing any of your usual solutions! Genuine curiosity is an incredibly powerful state because it is so open to new possibilities. By asking all of these questions and wanting to know the answer, you have engaged your subconscious mind in gathering information. Now that you have done this, imagine the outcome that you want in as much detail as possible, including any pictures, sounds, words or sensations you want to be experiencing. You will begin to notice that ideas are spontaneously coming to mind, that there are in fact a number of ways to achieve that particular goal. Don’t reject any of them, no matter how absurd, and let your subconscious keep working. One of these original ideas could be the brilliant alternative you’ve been looking for! When one of them feels right, you will experience a natural surge of motivation to begin working on that solution. Well done! There is no doubt that when we change the physical configuration of our body, there is a corresponding psychological change. Earlier I posted about smiling making you happier, even when you’re feeling down. Another example is non-verbal communication, the complex signaling that happens between people based entirely on posture, hand gestures, vocal tonality, and many other cues. Just in case you think I am overstating the power of this effect, it turns out that people systematically underestimate guesses when leaning to the left. That one even blew me away! In addition to the position of our body, our environment also plays a very large role on our mental state. The color red has connotations of danger, and this has deep evolutionary roots. The difference in energy level between a bright room and a dark room is profound – find a dimmer switch and try this for yourself! Thanks to our incredibly plastic brains, we can build up associations between any two phenomena over time, and this includes places and mental states too. For example, one common piece of productivity advice is to have a separate work space and non-work space. I am sure you see where this is going. When you want to change your behavior you need to change your mind, and you can always change your mind by changing either your body or the environment! Are you working on a laptop right now? Pick it up and move to another location! If you find yourself stuck in an unhelpful mental state, stand up immediately and go take a walk around the block. Focus on the sensations of your face and body, notice any tension you are holding there, and consciously relax all of those muscles until you are limp. When you are about to make a habitual decision – like opening that internet browser again – do something immediately to interrupt the usual pattern. Sit on the edge of your chair with your back straight to focus yourself on the task at hand. The power of this technique is both immense and incredibly subtle. The smallest changes in your body can affect your mind, and on the margin this can make all the difference. Learn how your body responds and keep trying different interventions! Here you are, locked up with internal conflict, unable to work and yet unable to play guilt-free. Remember the old saying, it takes two to tango. This conflict is inside of you, which means you are in the unique position to understand both sides of the argument – how often do we get that opportunity to help resolve a conflict?? The truth is, all of your parts have a positive intent for you (whether the other parts want to believe that or not). Each of them are trying to get you something that is important to you, so keep this view in mind when you talk to both parties in this conflict. First connect with the part of you that doesn’t want to be doing work. What does this part want for you? Allow the very first thought to come into your mind, whatever that thought is let it be. The answer may surprise you. Some parts want you to be happy, to play and have fun. Some parts are trying to protect you: maybe they are worried you will do the task incorrectly, or maybe they think the task will not accomplish your goals. Acknowledge what that part says and why that perspective is important to your life. Maybe you can find a way to address this part’s concerns right there in the moment! Once you have identified the ultimate reason behind your actions, remember what connecting with that feels like: the picture you see in your head, any words you hear, the wonderful sensations in your body. When you are finding yourself struggling to stay motivated, I want you to remember that place in full vivid detail, to remind yourself what it is that you care about and why you are doing this thing that seems difficult. When you act from that place, your positive motivation flows naturally from your goals into your actions, and you will find the energy to do what needs to be done. Once we start to get upset, these negative feelings can become self-perpetuating until it seems like we have never felt and could never feel any other way! The more intense the build-up becomes, the harder and harder it is to break out of those beliefs. The best way to escape this cycle is to interrupt the pattern before it even begins – with positive emotions. It turns out that one of the most powerful emotions is gratitude. There has been a volume of research showing that gratitude is correlated with greater subjective well being – people are happier, more productive, sleep better, have more control over themselves and their environment, and grow through challenges when they experience more gratitude. The effect is so strong that interventions have been done where people keep a journal and write down three things every day they are grateful for – try it for yourself and see! When you find yourself avoiding work, take a moment and think about the person you are most grateful towards. Then think about what you are most grateful about in your own life. Another powerful emotion is self-compassion. Consider yourself from an outside perspective for a moment: not only is that person suffering because of his internal conflict about work, but on top of that he is feeling shame, guilt, fear, anger and/or self-judgment too! Don’t you want to reach out and comfort that person? Don’t you wish you could do something to help? Remember that what you are going through is part of the shared human experience, and feel some compassion for yourself and your struggles – you will feel a lot better afterwards. I will leave you with one further note: try laughing! The situation may not be very funny at the time, so remember a recent situation or your favorite comedy routine, maybe even sneak away quickly to listen to it. If you can, laugh at how ridiculous the situation is! Everything will look a little bit brighter in that light. Have you ever completed a really big project, or had a difficult conversation with someone you care about, and literally sighed with relief at the end? You subconsciously used that sigh to release the tension you had been storing up in your body, and return you to a state of calm curiosity. It turns out that this technique – like smiling to become happier – works even if you do it intentionally. One effect of taking a deep breath is to oxygenate your blood, which leaves you feeling invigorated and ready to go. To get the largest amount of air into your lungs, you need to breathe from your diaphragm. Practice this by lying down on your back, and resting one hand on your chest and one hand on your stomach. Breathe slowly from the bottom of your lungs up, so that you feel your stomach hand rise into the air first. Do this several times, and try letting yourself breath normally, to feel the difference. You will quickly get the hang of it. So the next time you hit a block, before getting frustrated and conditioning yourself to dislike work even more, take a deep breath and relax! Afterwards, take another look at your work with a set of fresh eyes. Nonviolent Communication is a communication and conflict-resolution process developed by the psychologist Marshall Rosenberg. The book focuses on how to express ourselves in a way that inspires empathy in others, and how to listen to them empathically in turn. This system radically changed my understanding of human interactions, and using these techniques with myself greatly reduced my own level of self-judgment. I highly recommend this book. 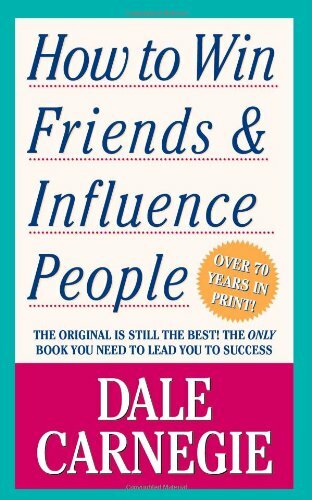 How to Win Friends and Influence People is a classic book by Dale Carnegie with a pretty self-explanatory title. I read this book recently, and was surprised to find that it epitomized a lot of the wisdom I had already picked up from a variety of other sources. Note that this summary is from the revised 1981 edition, which removed the sections on writing good business letters and achieving marital satisfaction. 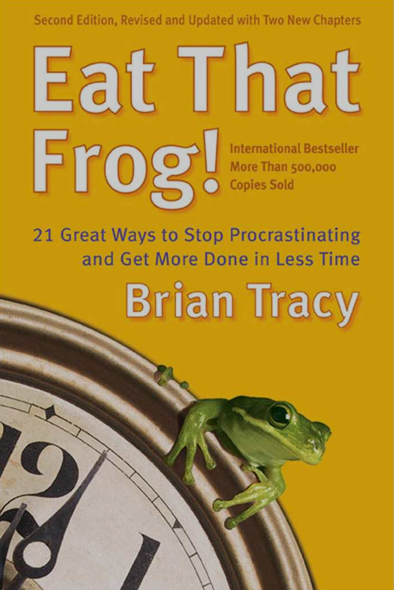 Eat That Frog by Brian Tracy is an excellent synthesis of much of the existing productivity literature to date, achieving about 80% of the total benefits from time management. My summary here attempts to condense the book into a few pages of critical insights, organized into four primary sections: organization, efficiency, identifying your strengths, and optimizing yourself. Implementing even a small number of these techniques will result in greatly increased effectiveness.